Prior to the advent of the microprocessor, a computer was usually built in a card-cage case or mainframe with components connected by a backplane consisting of a set of slots themselves connected with wires; in very old designs the wires were discrete connections between card connector pins, but printed circuit boards soon became the standard practice. The Central Processing Unit, memory and peripherals were housed on individual printed circuit boards which plugged into the backplate. During the late 1980s and 1990s, it became economical to move an increasing number of peripheral functions onto the motherboard. In the late 1980s, motherboards began to include single ICs (called Super I/O chips) capable of supporting a set of low-speed peripherals: keyboard, mouse, floppy disk drive, serial ports, and parallel ports. As of the late 1990s, many personal computer motherboards supported a full range of audio, video, storage, and networking functions without the need for any expansion cards at all; higher-end systems for 3D gaming and computer graphics typically retained only the graphics card as a separate component. The term mainboard is applied to devices with a single board and no additional expansions or capability. In modern terms this would include embedded systems and controlling boards in televisions, washing machines, etc. 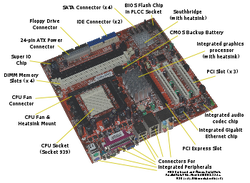 A motherboard specifically refers to a printed circuit board with expansion Temperature and reliabilityMain article: Computer cooling Motherboards are generally air cooled with heat sinks often mounted on larger chips, such as the Northbridge, in modern motherboards. Insufficient or improper cooling can cause damage to the internal components of the computer and cause it to crash. Passive cooling, or a single fan mounted on the power supply, was sufficient for many desktop computer CPUs until the late 1990s; since then, most have required CPU fans mounted on their heat sinks, due to rising clock speeds and power consumption. Most motherboards have connectors for additional case fans as well. Newer motherboards have integrated temperature sensors to detect motherboard and CPU temperatures, and controllable fan connectors which the BIOS or operating system can use to regulate fan speed. Some computers (which typically have high-performance microprocessors, large amounts of RAM, and high-performance video cards) use a water-cooling system instead of many fans. A 2003 study found that some spurious computer crashes and general reliability issues, ranging from screen image distortions to I/O read/write errors, can be attributed not to software or peripheral hardware but to aging capacitors on PC motherboards. Ultimately this was shown to be the result of a faulty electrolyte formulation. A microATX motherboard with some faulty capacitors.For more information on premature capacitor failure on PC motherboards, see capacitor plague.Motherboards use electrolytic capacitors to filter the DC power distributed around the board. These capacitors age at a temperature-dependent rate, as their water based electrolytes slowly evaporate. This can lead to loss of capacitance and subsequent motherboard malfunctions due to voltage instabilities. While most capacitors are rated for 2000 hours of operation at 105 °C, their expected design life roughly doubles for every 10 °C below this. At 45 °C a lifetime of 15 years can be expected. This appears reasonable for a computer motherboard. However, many manufacturers have delivered substandard capacitors, which significantly reduce life expectancy. Inadequate case cooling and elevated temperatures easily exacerbate this problem. It is possible, but tedious and time-consuming, to find and replace failed capacitors on PC motherboards. Peripheral card slotsA typical motherboard of 2009 will have a different number of connections depending on its standard. Some motherboards have two PCI-E 16x slots, to allow more than 2 monitors without special hardware, or use a special graphics technology called SLI (for Nvidia) and Crossfire (for ATI). These allow 2 graphics cards to be linked together, to allow better performance in intensive graphical computing tasks, such as gaming,video editing etc. As of 2007, virtually all motherboards come with at least four USB ports on the rear, with at least 2 connections on the board internally for wiring additional front ports that may be built into the computer's case. Ethernet is also included. This is a standard networking cable for connecting the computer to a network or a modem. A sound chip is always included on the motherboard, to allow sound output without the need for any extra components. This allows computers to be far more multimedia-based than before. Some motherboards contain video outputs on the back panel for integrated graphics solutions (either embedded in the motherboard, or combined with the microprocessor, such as the Intel HD Graphics). A separate card may still be used. Motherboards are produced in a variety of sizes and shapes called computer form factor, some of which are specific to individual computer manufacturers. However, the motherboards used in IBM-compatible systems are designed to fit various case sizes. As of 2007, most desktop computer motherboards use one of these standard form factors—even those found in Macintosh and Sun computers, which have not been built from commodity components. A case's motherboard and PSU form factor must all match, though some smaller form factor motherboards of the same family will fit larger cases. For example, an ATX case will usually accommodate a microATX motherboard. Laptop computers generally use highly integrated, miniaturized and customized motherboards. This is one of the reasons that laptop computers are difficult to upgrade and expensive to repair. Often the failure of one laptop component requires the replacement of the entire motherboard, which is usually more expensive than a desktop motherboard due to the large number of integrated components.